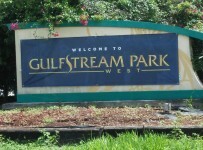 Gulfstream Park plans a 10-race card on Saturday, with 94 starters listed to run at Calder Race Track in Miami Gardens, Fla. Five turf races (#2,4,6,8,10) are planned with a first post time of 1:15 PM ET. In Friday’s action, 71 starters (15 scratches), ran under cloudy/firm conditions. 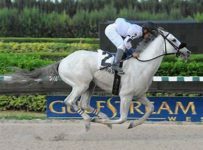 Just one odds favorite (race 3), hit the win column with Heidi Ho winning by 4-1/2 lengths saddled by Edgard Zayas. The surprise on the day was Si Te Vas (If you go in English), winning the last race at 28:1 odds. That upset the Late Pick 5, which paid $168.50 on 4 of 5, and sets up a nice $20,222 carryover for Saturday. The Rainbow 6 wager paid out $23,222.80 to a single winning bettor. That last race had just 6 starters, and – being a two-year-old jaunt – perhaps the bettor went ALL on that last leg. The late Pick 4 paid $2,023 on 4 of 4. Nonetheless, the safer bet Saturday will be the Pick 5 since you are playing with the losers money of Friday in the mix with the carryover vs. no carryover on the Rainbow 6. Total handle was $3.75 million.